In mushroom cultivation cereal substrate is being used to produce grain spawn. This production stage is mainly used to expand the mycelium mass that you get from the agar- for the inoculation of fruiting substrates. Soak the rye in 167°F/ 75°C warm water, allow the water level to be 4 – 5 cm higher and leave it in the tub overnight (12 - 18 hours). Put the soaked rye grain into a sieve and let it drain for about 15 minutes, then put it into the mixing container. Moisturise the Vermiculite using the sieve, until entirely soggy, watch out not to soak it too much. 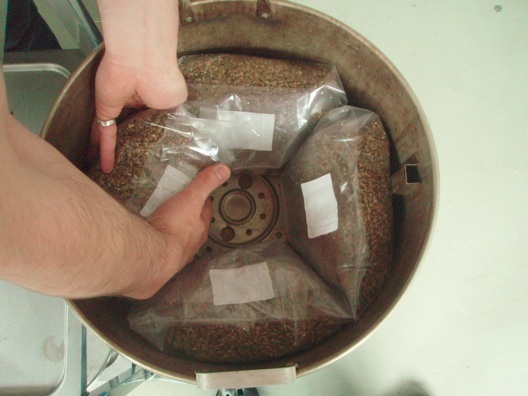 Make sure that the Vermiculite is evenly wet, but not as wet that water runs out of the sieve. Let it drain for 15 minutes. Now mix the gypsum equally with the rye grain, then add the Vermiculite and mix it again very well. For one Unicorn bag Type 3 TL use 1,45 kg rye grain, 1,8 L Vermiculite medium and 9 g gypsum. This formula will result in 3 kg rye grain substrate. Time needed to sterilise: 3 – 4 hours. 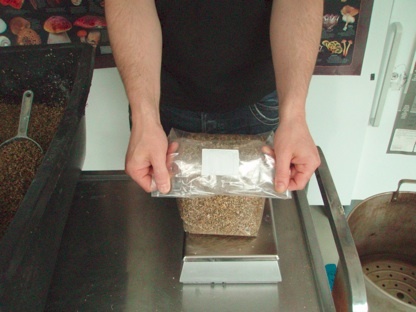 Roll down the autoclave bag about 10 cm and pour in 2.7 kg of the grain substrate mixture. Be careful not to spill any substrate on the upper regions of the bag (in case you did, clean the bag with a wet piece of cloth). Then wrap the bag twice. A pressure cooker is used for the sterilising process. Overlying a 2-3 centimetre water level at the bottom of the cooker, a separating insert keeps the bags above the water line. Assure yourself that there is no contact between water and the bags, decant some water if necessary (mind the operating instructions of your pressure cooker!). Now load the bags. If the cooker is big enough you can make two levels of bags. Place the upper layer on a separating tray between the levels. This ensures that the steam gets evenly distributed. Get the lid locked and put the cooker on a hotplate and start the heating. Wait until you can see steam leaking out, then close the outlet. Count the sterilisation time from the moment the pressure gauge reaches its highest stage (for household pressure cookers). If you've got a professional pressure steriliser at your disposal sterilise at 121°C/ 250°F/ 15 psi/ 1.05 bar. After the cooker is fully depressurised, open the lid. The bags should cool down to room temperature in front of a HEPA-filter or in a Glove Box. As soon as the substrate has cooled down below 30°C/86°F, it is ready for inoculation. If you want to continue at a later date close the bags tightly, store the substrates in the refrigerator (35.6-39.2°F, 2-4°C) and use them within 4 weeks.